Linseed oil has been at the heart of the decorating world for centuries. Linseed oil is the soul of one of Europe’s longest established manufacturers, the core ingredient of most of their products. Linseed oil glazing putty is the traditional product for bedding in new glass in wooden windows, and creating an angled rebate for the rain to run off, original putties from 1600’s are still around. Various forms of linseed oil putty have been used in the marine (painting) industry for centuries, coping with the worst elements on earth. 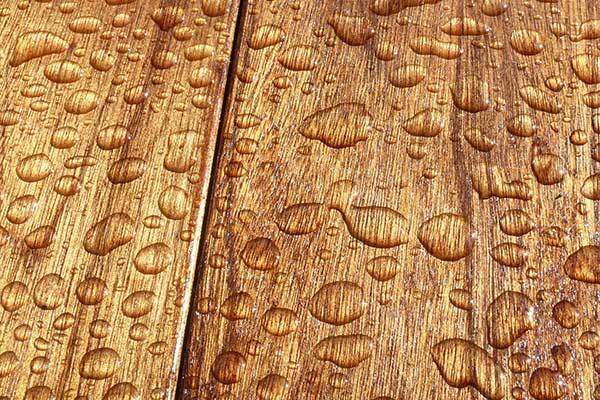 Linseed paint is a traditional exterior coating that lasts years and years applied on bare timber. Linseed oil is still one of the favoured products in furniture finishing. Times move on and in one video, you are going to see a comprehensive and “modern” approach to handling and mixing linseed oil glazing putty, followed by information on a “new” linseed paint and plenty of options for linseed oil in modern living. Compare this clinical stainless steel and gadgety experience, to the experience of many first time users and apprentices, up to their elbows in goo, newspaper stuck to their putty, putty stuck to them. Matt Evans has a lot of experience with linseed paint. A traditional potion, it works wonders as long as you start from bare timber. This is a project he completed on a Carmarthenshire farmhouse using Potmolen Linseed oil paint (available from Tel 01985 213960) and he ground the pigments himself to tint it. Like the Limewash, Linseed Oil Paint needs to be maintained slightly differently to your conventional paint. As it weathers, pigment is exposed and the colour changes slightly, new wood will need to be puttied up and touched in if any joints open over the next few years, so make sure you keep the leftover paint. I would recommend an additional coat on exposed areas but for the most part a thin coat of warmed linseed oil will refresh the surface and give you a rich colour again. This can be carried out when necessary. Traditional Painter Matt is based in S Wales. 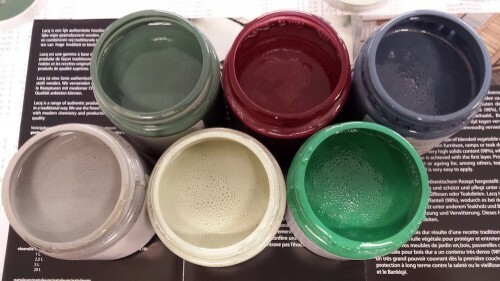 We have our eye on some promising developments with a tintable quick drying linseed paint from Holland. To be accurate, this basic linseed product is more of a stain/oil/varnish, which currently comes in a few stock colours (see chart). The clear base coat recipe is years old and proven, and contains linseed oil as well as tung oil, which helps the first coat penetrate into the wood. 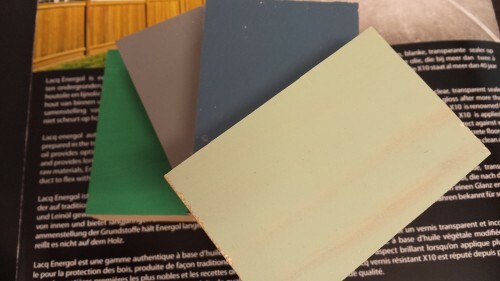 A UK supplier, however, is working on a custom tinting process, and once it has been verified, it looks like UK painters and specifiers who favour traditional and natural paints (in strong custom colours) will have a superb quick drying opaque linseed based coating for exterior woodwork. and some pots that are in testing. Did you know, linseed oil “putty” is used in different forms in the wooden boat maintenance world, from fine surface filling to stopping? Especially when stopping up gaps, soft linseed-based products are much more boat friendly than the super Sikaflex products that set harder than the wood and are near impossible to remove when they fail, which they will. Linseed oil is part of the traditional “goop” that preserves wooden hulls. On the inside of the hull, we stripped off all the paint and soaked the timbers in several coats of “goop” – a technical term for a traditional mix of linseed oil, pine tar and turpentine. This tried and tested concoction feeds the wood and lets you see exactly what condition the planks are in. And it smells good too. If you have any questions about linseed oil, check out the Dutch Vliegenthart website, making linseed oil product since 1839. Willem the Cook, the Jamie Oliver of oils has encyclopaedic knowledge of the qualities and charm of linseed. In 1839 Leendert Vliegenthart started an oilseed crushing operation in a windmill in Zwijndrecht (The Netherlands). Soon the business was so successful that operations were established in Delft and Dordrecht. First the machines were powered by wind energy, later with steam; now it is a modern company that works with electricity and computers. Traditional Painter, Adam Bermingham finishes furniture with linseed oil, a tried and tested approach. What have you used linseed oils for? Remember, if you follow the techniques in the putty mixing video, don’t forget to remove your linseed oil putty from the bread mixer bowl. It doesn’t rise very well in the oven.